Blogging conference season is well under way. There are a ton of conference guides out there and I wouldn’t dare to duplicate them, but I haven’t seen one out there for introverts. As a member of that “tribe”, I can tell you that you can successfully attend a blogging conference, make connections and contacts while still keeping your sanity. 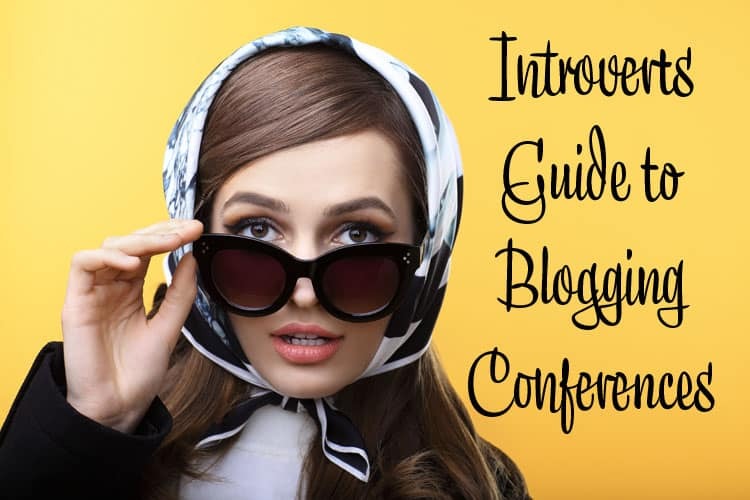 So I’ve created this Introverts Guide to Blogging Conferences for those of you who need it. I must first slightly digress and say there is a difference in being introverted and shy. I am not shy. I just can only take so much of people and noise and stimuli before I need to take a break. Also, it is really hard to get me to go somewhere where there will be a lot of people and noise and stimuli. However, once I am there and engaged, I am not shy. That’s why most people don’t believe me when I say I am an introvert. And as a “veteran” of dozens blogging or social media conferences, I do have a few tips to share. Think about your blog. What is your elevator pitch or “what are you all about?” You are going to have to answer this question over and over. It would be best if you thought about it ahead of time. Order blog cards. These are business cards for your blog. They have your URL, your Twitter id, your email address, your Facebook page, etc. There is always an exchange of these cards in nearly every instance that you meet someone and it is better to have them than not. If you are shy, or in one of your “I need to check out moments” and the conversation doesn’t always go the way you wanted. There is always the opportunity to still convert someone to become a reader of your blog if they look up your blog post-conference. Study the schedule/agenda. This will allow you to plan your outs. Decide what is important to you and what can be skipped if you are feeling like a break. When planning what to wear to a blogging conference, think comfort. That doesn’t mean shabby, but something you feel good in. Plan some flare. Something that you can wear externally that can be a conversation starter. I have many, many pairs of glasses, but when I go to a conference I usually wear one of my funky red pairs at least one day. If not glasses, a fun pin, a hair-bow or ribbon, fun shoes…. If you can help it, don’t hide behind your laptop, iPad or iPhone. Be present. Try to push yourself out of your comfort zone, but don’t go crazy, you will just exhaust yourself mentally and then feel bad. Further to that, don’t judge yourself. You are already in an environment that is not second nature to yourself, give yourself a break! Don’t forget to pass out your blog cards. Don’t just shove them at people. Ask others if they have one and if you can exchange. Don’t get sucked into the “missing out syndrome.” You will not suffer a great and perilous loss if you don’t attend every single session, every single party, etc. Life will go on. Quality versus Quantity. You don’t need to meet every single person in the room. But it would be good to have some real conversation with a handful of people. It will go a long way and you way meet your new BFF. Follow-up. Take all those blog cards you read and visit each one of them. Find a post to comment on and leave a comment not only about the post but that you were pleased to meet them. Lastly, I would suggest trying to attend smaller, more focused conferences. So that is my two cents as an introvert attending conferences. How about you? Got any additional advice to offer? This is an utterly fabulous guide (for introverts AND extroverts, honestly. Conferences are overwhelming!). I’m going to bookmark this to read the day before BlogHer this year! This is a good guide, thanks!! I’m a total introvert and I just bought a ticket to my first conference: Bloggy Boot Camp Boston. I’m so nervous!! @Eve, oh you will have such a great experience. And you will ADORE Tiffany! I’m totally going to BlogHer–we should definitely meet! 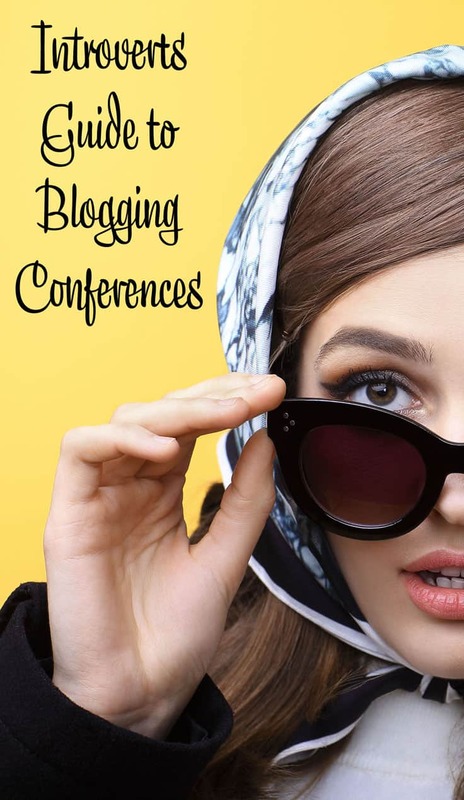 I have yet to attend a blogger conference but they sound fun and I always like meeting fellow bloggers- so thanks for the tips! Oh! I would never have thought about getting blog cards. I really hope to attend one someday soon. It sounds wildly fun. @Jennie, I am working on getting one in London! @Jacque, I am so glad I could help! What conference are you attending? I’m a non-shy introvert too. I go to conferences fairly regularly for work and manage just fine, but a blog conference just seems to much more social. The whole room-sharing thing totally freaks me out. I need my alone time at night. Great tips – thanks! Will keep in mind if I ever get to go to one. @MamaRobinJ, oh no….no room sharing for me! I hope you do get to one, they are great and very useful for your blog. I’m a fairly new blogger (just over a year) and I think that this is the year for me to take off. I know that blog conferences are a big part of that and I am looking forward to attending at least one this year. @WaningWoman, it really does give you a little boost. Great list! As an introvert myself, I found Bloggy Boot Camp to be the perfect set up. Happy conferencing everyone! @Amy, it was! And I enjoyed meeting you! I love reading about blogging tips and hope to attend one of the camps as soon as I’m able. In the meantime, is there a blogging book you would recommend? I like the card idea and there have been many times where I wish I had something to hand out. However……I am a bit perplexed about how open I want to be with those from the military (especially since that will be my main environment in the near future). I want followers, but I also want a certain level of privacy. @HotPink, thanks, I have been checking you out too! My Dad was in the Army for 30 years, finished as a colonel, so I am an Army brat! I will send you some books to read, but there are some great blogs too, will those over as well. Thanks so much! This is really helpful as I prepare for SITS Boston! Thanks for this. I’m going to my first conference this summer—BlogHer—and I’m a little nervous. I’m shy but I can usually overcome that; my real issue is that I get overloaded easily! I think I have fairly reasonable expectations—I don’t expect to get invited to parties and meet every blogger in the place—but I do want to try to get out of my comfort zone and talk to people and have some fun. I didn’t even think about having cards made. I guess I’ll get on that! @Mo, well it will be my first Blogher too along with Ginger who commented below, maybe we can meet? I would love that! We’ll have to make that happen! What a great post! I don’t consider myself an introvert, but I will be attending BlogHer and it will be my first bloggy conference. I have attended other business conferences it the past, but am nervous about this one. Thank you for the tips! @Laura, I see a meet-up in the works! Glad you liked the post! These are all very practical tips! Ugh- I don’t usually leave links like this on someone else’s post, but I think you might actually be able to relate. @Shell, thanks for leaving the url! I love it! This was very interesting, Andi. I am an introvert as are many bloggers and haven’t yet been able to overcome the resistance to go to a conference yet. @Alison, it is not easy, but I have found it rewarding. I was looking for the content here and there and got to visit your blog. I must say that I am in the hand of luck today or else getting such a wonderful writing to read wouldn’t have been achievable for me, at least. Truly thankful your writing. @SMS, thanks for the compliment! I love this blog post. This is something I struggle with. These are great tips. Conferences can be really hard when you are feeling this way. Also, not everyone there understands, sadly there are a lot of not nice bloggers out there. Thanks for the post! I’m just ordering my first batch of business cards specifically for my blog to hand out at my first blogging conference next month. As an introvert, but equal parts excited and nervous for the networking. Whether you love being around people or not conferences can be stressful, long and exhausting. You’ve provided some wonderful tips. I would add to leave yourself some time to just relax even if it’s just to walk away during the “breaks” go outside and just be by yourself and breathe (or catch up on your social media!). Great advice. I am kind of done with most conferences, however I do agree you need business cards to be able to network. If something I say find people on your niche that can help you grow. Do not be shy and say hello. Most people there are feeling like you. I have seen people passing something small like candy to break the ice. That is a good idea. I’m smack on the line between introvert and extrovert, but the introvert side is winning lately. I love people and I’m not shy – but only for so long! Because I definitely need to take my breaks and check out for a bit! This is all such great advice. I will definitely take it whenever I get up the guts to go to a blogger conference. I have not been to any blog conference , but I wish I have a chance and enjoy the time with fellow bloggers. I’ve wanted to go to a blogging conference but always felt very uncomfortable about going alone. While I am not totally an introvert, I tend to do better if I am with someone I know. I love the idea of wearing something that can somehow act as a conversation starter and also having blog cards. I wouldn’t have thought of either of these. Thanks! Wow. Great post! You answered everything that has crossed my mind about blogging conferences. I am headed to my first one this year and can’t wait. I’m a total extrovert. I get excited just thinking about being in large crowds talking and engaging with people. This totally comes in handy being a blogger. I meet many bloggers that say they are introverted and like you they aren’t shy. You absolutely don’t need to be an extrovert to be successful at this, you’ve just got to have great tools like this in your back pocket. I’m such an introvert, and your post hit home in every way. Last year, while they weren’t conferences, I did go to a couple of food photography workshops. While I was worn out from people by the end of the day, I couldn’t have asked for a better experience. I’m so glad you mentioned visiting every person’s site. I did the same thing and left a comment. A number of the people I met have turned into really great online friends!